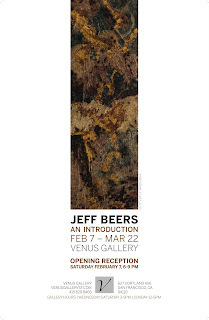 In the first exhibition, of 2009, Venus Gallery introduces San Francisco painter Jeff Beers. Beers’ large format, abstract compositions are as likely to evoke a broad sense of landscape as they are a view through a microscope. The compositions are meticulously rendered in wax, resin, emulsion, tar, paper, paint and natural pigment. Regardless of the scope, the dynamic of nature is strongly felt throughout each piece. Beers achieves rich texture by alternately building up the medium and scraping down the surface. The result reveals a depth that takes the viewer on a journey that beckons multiple viewings. Jeff Beer’s work struggles out from under the layered canvas, where undulating subterranian essence is held captive in resin. Look at it once , look at it twice look at it three times and it draws one back again and again to see what is lurking in the work.